I’ve been kicking around about doing a Jim Aparo post on this blog forever, and it’s long overdue. Before I delve into the general aura of magnificence that was the Aparo Batman, I should say a few words about the book whose cover you see scanned above and whose subject matter forms the reference points of this post. This was the first trade that I ever owned. I bought it with allowance money back during the Bat-mania that gripped the known universe after the release of the first Tim Burton Batman, and I’m sure it was the promise of the cover that got me to pick it up. 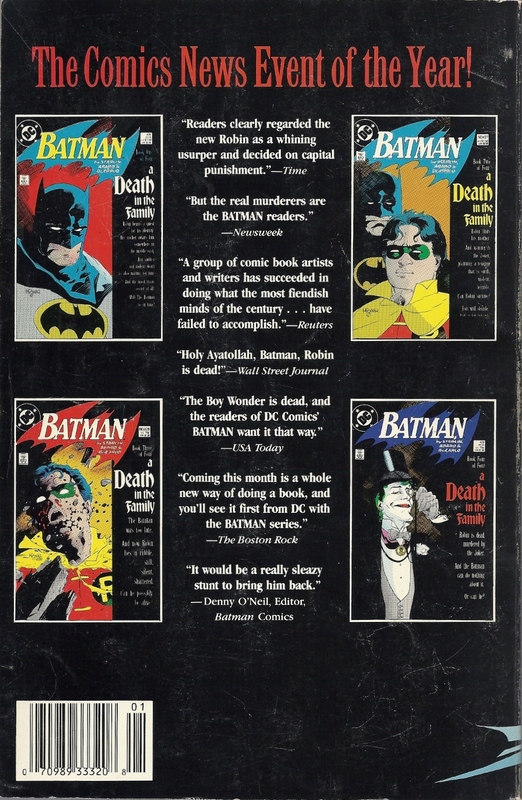 I was a youthful dilettante when it came to my comics reading, and the death of the Jason Todd Robin (if I even knew there was a difference between the “Todd” and “Grayson” brands) had passed me by. But there he was on the cover, in Batman’s arms. Dead! And the cover said it was a bestseller. A comic book a bestseller. And a controversial one at that! How could I have resisted? The real reason I treasure this book, and why it still has a prized place on my library shelves along with the Faulkner and Tolstoy and such, is the journey it’s been on. I’ve carted this bleeping thing to school with me as a kid, through more moves than I care to count, halfway down the Atlantic seaboard, in backpacks, bags, boxes, and Lord knows what else. It’s been dragged around so much I’m amazed it’s not more worn than it is. And I’ve lent it out to various friends and, most memorably, my sixth-grade teacher. He was a hero of my early youth, a big burly guy who’d take us outside on nice days and — his words — “let us run around like dogs,” tossing a aerodynamic nerf football to us all, and sometimes taking us outside to launch one of those mini-rockets off and lettings us chase after it as it parachuted back to Earth. He had a real Kindergarten Cop thing going on with kids. A few years later he was my high school basketball coach, where he gave me my favorite nickname ever, “Laimbeer,” because I had a penchant for flopping to draw charges like Bill Laimbeer and, like that Detroit Pistons great, was wont to gun it from outside even though I was often the tallest guy on the court. I was as happy that moment as could be. A pig in, well, you know… A guy I looked up to just asked to borrow my Batman book — not only was he letting me do him a favor, he was revealing himself to be a Bat-fan. He rocketed up the ladder of my estimation, and I lent him the book. So that’s a big part of why I love this thing so much. 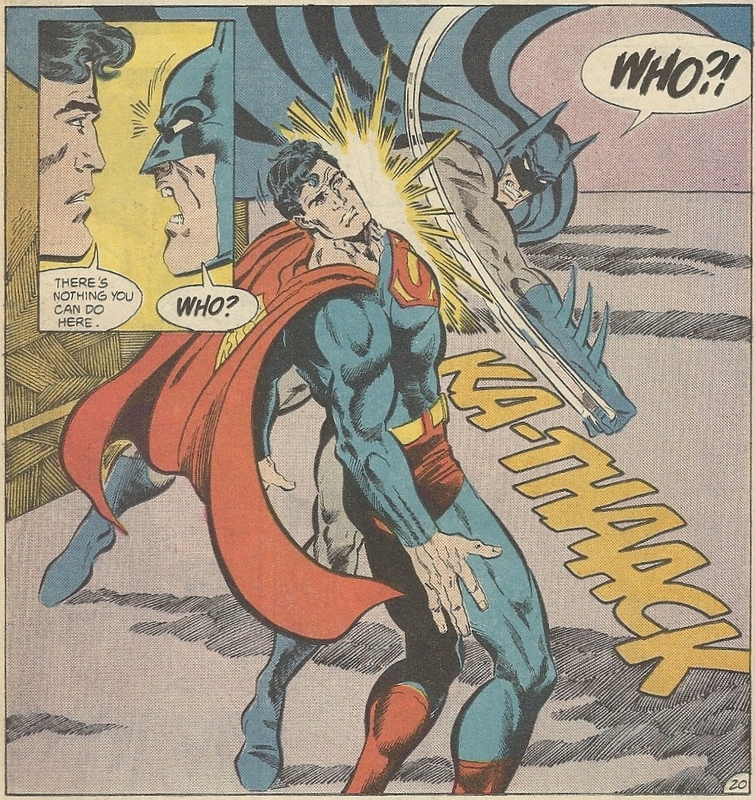 Aparo was to Batman in some ways what Curt Swan was to Superman — both were long-term steady hands on flagship characters. Neither was ever as scintillating to the comics reading public as a Jack Kirby or a Neal Adams, but they did their jobs incredibly well and generated images of icons that defined those characters for generations. They were talented workhorses — they never won Kentucky Derbies, but they got the fields plowed in time for one hell of a harvest year in and year out. Aparo didn’t have the length of association with Batman that Swan had with the Big Blue Banana, and he spent much of his time with Batman on secondary Bat-titles like The Brave and the Bold and Batman and the Outsiders. But instead of lessening his legacy, perhaps that makes the permanence of his iconography more remarkable. Aparo’s Batman has stood the test of time. It’s been a while since his pencil traced the outline of the Caped Crusader, but I still think his rendition tops all the others I’ve ever seen. That’s my personal opinion, I know, though it’s (justly) shared by many others. We all have our favorites. I’ve waxed nostalgic about Norm Breyfogle’s Batman of my youth, but Aparo’s was the 1A of that time. His was the clear, and I mean CLEAR, numero uno. Batman under his ministrations was grim (isn’t he always?) and ramrod straight, lean and foreboding, with long pointed ears that looked sharp to the touch and had enough length to impale you if you got out of line. And there was that frown — it was a look that could stop you in your tracks and turn you to stone. There was something regal in the Aparo Batman’s bearing, and I always thought I could read the inner workings of that detective mind better when Aparo was on the job. I could quibble about certain things with his general style. Well, more than a few things. This isn’t pure, unmuddied love we’re dealing with here. His men often looked alike — though that’s a common complaint for many artists, it seemed exacerbated with him. His Bruce Wayne and his Superman were indistinguishable from the neck up. His early work could be a bit dodgy, but it was early work. He was still getting his feet underneath him. And, to be quite frank, I’ve never taken to his style all that much when he’s worked on properties other than the Caped Crusader. He’s like Ron Lim in that regard. Lim drew a spectacular Silver Surfer, one who glistened and glowered like none other ever could, but his non-Sentinel of the Spaceways work left me cold. I’m more tolerant of Aparo’s non-Batman production, but there’s a similar dynamic at play. Nobody’s perfect, folks. And Aparo drew an incredible Batman, who stands at the top of the comics pyramid, or near it, since I’d put Superman at the apex. But you get the picture. To do such great things with one of the great characters? That counts for a lot. Let’s have a look at a couple of my favorite Aparo bits. 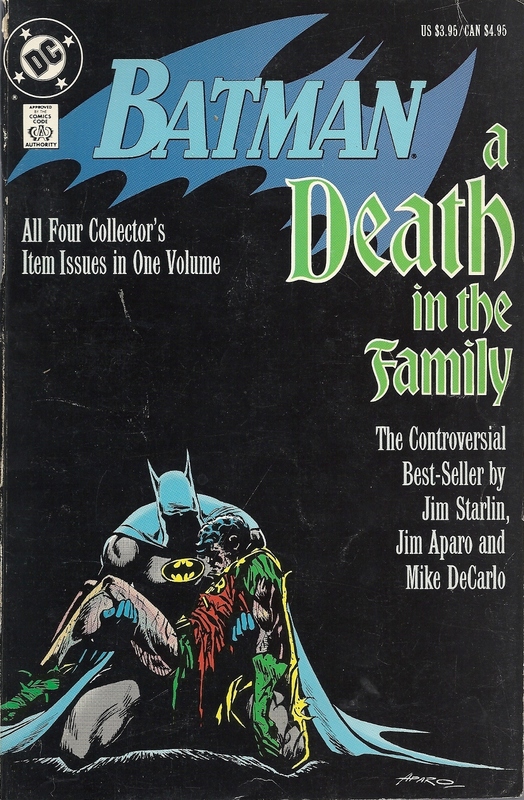 The Jim-Starlin-penned “A Death in the Family” was a pretty damn big event, so it’s no wonder that it’s widely regarded as the high-water mark of Aparo’s Bat-times. I won’t go into the broader issues that went along with the storyline, how loathed Jason Todd was (though his mother handed him over to the Joker before he was almost beaten to death and then blown up — it’s hard not to feel bad for the guy after all that), how the 900 number (perhaps rigged) sealed his doom, or any of the other associated hoo-ha. 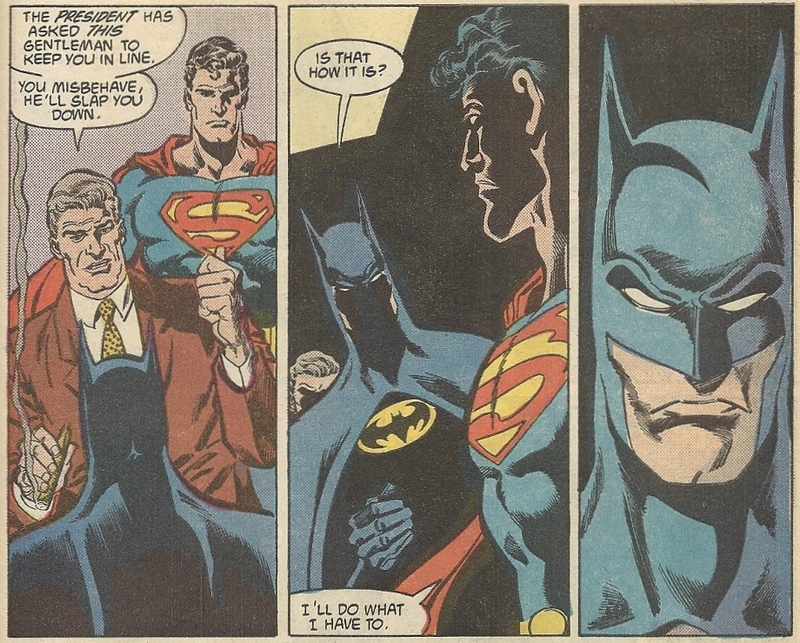 What I remember most about the series came at the end of the third issue of the arc, in Batman #428, when Superman showed up. I’ve always loved the quiet moments that Kal and Bruce have shared, especially after their pre-Crisis chumminess went bye-bye and their deep differences (tempered by profound respect) were magnified. All that crystallizes here in a few pages in a couple of issues. 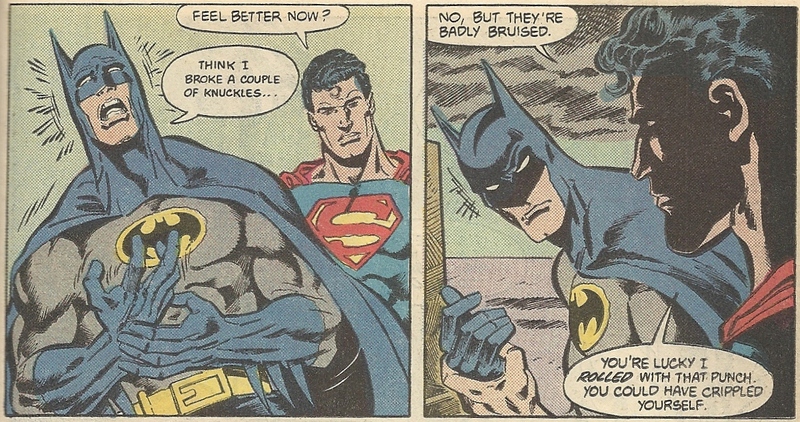 Superman is always rubbing it in. He doesn’t realize he’s rubbing it in, mind you, but he’s still doing it. For me these bits will always be part of Batman’s core definition, and are a big part of the reason why, when I hear the name Batman, Aparo’s art pops into my head. Who cares that the old blue accents and yellow emblem have fallen out of favor? I have to make an honorable mention of Mike DeCarlo’s inks, which you can’t ignore with all the dark shading of these rather depressing scenes. For much of Aparo’s time on the main Batman titles they were teamed, and they meshed so well together. You can see that in these scans. Kudos. I’ve rambled a bit here, but it’s been fun to hash out some of my Aparo love. It makes me very sad that he’s no longer with us, and sometimes I wish that we could “bring him back” like they did with Jason Todd. I wouldn’t care if that resurrection was a “sleazy stunt” or not. I miss his Batman, and it might be nice if he could have one last go around with the cape and cowl. But all things come to an end, I suppose, and the man deserves to rest in peace. He earned it. He gave me “my” Batman. He gave me a lot. ← Is he waving? Carrying an invisible boombox over his shoulder? Agree with you totally – Aparo is THE Batman artist for me as well. 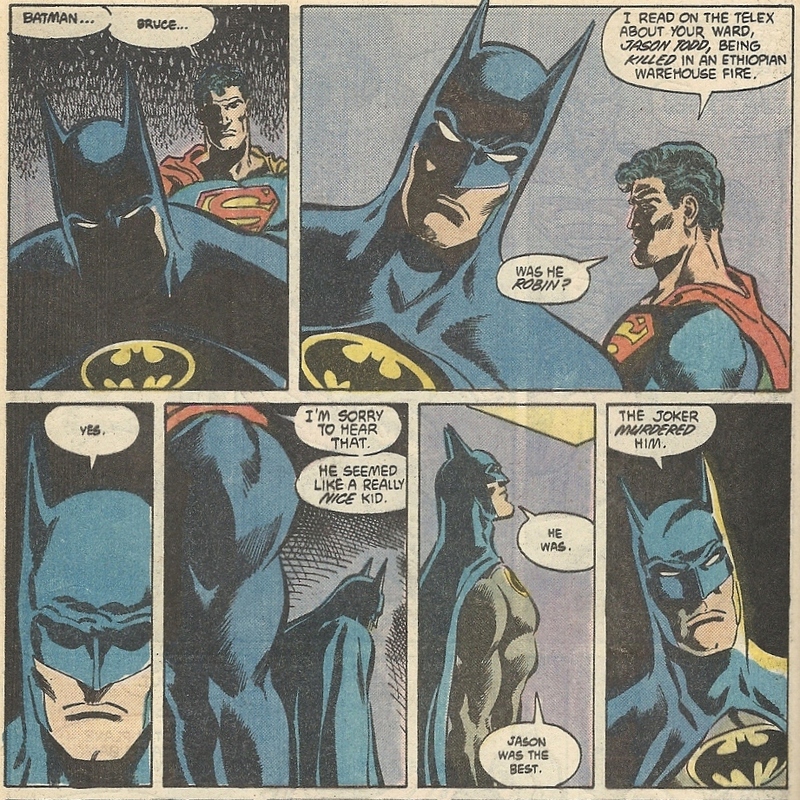 I wasn’t the biggest Bat-fan (hell, I was more of a Marvel boy back when I was a big comics reader), but I followed Brave and the Bold pretty regularly just because of the wonderful Aparo art. He is definitely missed. It’s always good to clink glasses with folks over how great the Aparo Batman was (and is). Agreed, agreed, though I think I liked his late ’60’s Aquaman even more. But, Jared, don’t you have to agree Aparo’s Batman was closely modelled on what Adams had established (at least in his early B&B issues)? I suppose — though I’ve never been the biggest Adams fan, I’ll give him his due. 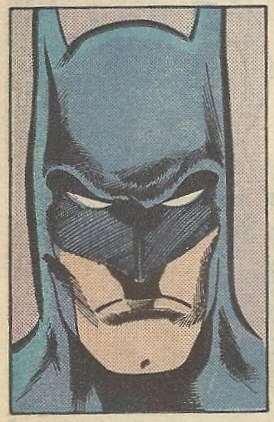 The aesthetic of the character evolved with Adams, but I think Aparo refined Batman to his finest look. Other artists have come after, and I’ve just never been able to escape the impression that their “steps forward” are really steps back. Totally with you on the Aparo love, but I’m not a fan of “Death in the Family” at all. For starters, there’s the flat-out cynicism of leaving a character’s fate (and young boy character, at that) up to a telephone poll (not helped by the knowledge that Denny O’Neill was supposedly “shocked” that it went against Jason. Way to foist off your job on others, Denny). But I also hated that bit about making the Joker the Iranian ambassador, which threw all credibility right out the window, for me. Moreover, in all honestly, this wasn’t my favorite era for Aparo art. Somewhere late in his B&B run, he gave up his earlier, more detailed and sinewy Adams-esque approach for a looser, more cartoony style and by the end I wasn’t digging it at all. For me, the high point would have been those early B&B’s and the phenomenal “Bat-Murderer” multi-parter in Detective, which sadly he didn’t do the last chapter for. You need to keep an eye out for the upcoming 50th anniversary installment of Back Issue magazine, which promises to spotlight Aparo’s Batman contributions and — for once — will be printed entirely in color. Should be out in July. I can’t really argue ith any of you DITF quibbles — I was a more accepting 11-year old when I first read it, and that youthful suspension of disbelief has carried over into my adulthood. The wonders of nostalgia. If it’s any consolation, I learned in my superficial pre-post research that the Joker’s ambassador tenure has been retconned in recent years to one of those fictional Middle East nations (Qoraq or some other nonsense). At least, I think I read that. Thanks very much for the heads up on the Back Issue bit. I’ll keep an eye out for that. Another vote for Aparo as one of the great Batman artists (although I’ll stick with Sprang as the pinnacle). One thing you didn’t mention is the way Aparo made Batman’s cape so absurdly long that it became ridiculous. And yet, it worked, for some non-intuitive reason. I’ll always remember the first two pages of Deathmask (from Tec #437) as one of my favorite pieces of sequential art. The Jason Todd character was botched from the word go. I mean, seriously, a circus acrobat whose parents were murdered by crooks? That was a slap in the face to readers, which was probably why they retconned it. That’s cynical, and so was the whole 900-number idea. How could they not have known that the vote would be for death? You’re right about the cape. It never stood out for me because that’s the one I grew up with. At least, I think that’s the reason. It was the new normal at that point. Poor Jason Todd has always made me think of the Homer-voiced Poochie character on the Simpsons, the one the producers of the show-within-the-show Itchy and Scratchy threw into that program. Unloved and unsuccessful from the start. My vote is also for Aparo. Those ears!!! I have always been a Batman fan, re-runs of the 60s show got me hooked before I even started reading the books. Growing up, the only Bat-Book I subscribed to (through the mail no less!) was Brave and the Bold. I will never forget my first Aparo book, I got it at a yard sale, issue #124. Teamed up with Sgt. Rock against the 1000, and the writer and artist both appeared in the book! I have over 100 pages of original art, but I don’t think I have ever been more excited about opening my mail than when I got my Aparo Batman:LOTDK page. Is there some way we can put Jim in the Lazarus Pit and get rid of Jason Todd again? I don’t own any original art, but some Aparo Batman (along with Ditko’s Rom, of all things) would be at the top of the list. Any link to the image of the original Aparo art you own ? I’d love to see it ! Exactly, this is my Batman as well. Well-written article!